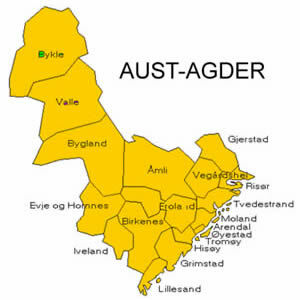 Aust-Agder county has a population of 103,394 and is in the southernmost part of Norway, usually called Sørlandet(the Southern Land). The beautiful Setesdalen valley runs through the county up to its northern border. Arendal is the capital and the largest town with a population of 39,495. Click on a location below to find Aust-Agder hotels, Inns, hostels and other lodging.